From the time that he got his first video camera, Thulani Smith ’20 has been documenting his life through the lens. As a middle-schooler, Smith captured everything from family trips to everyday life. His specialty at the time was creating basketball trick shot videos of his brother and his friends shooting balls into trashcans in the front yard. But Smith started experimenting and learning how to create visual effects, and he became more interested in the full potential that filmmaking had. Now, as a digital media production major at Butler, he already is getting the experience he needs to grow in his craft. Smith currently posts his work on his Facebook, YouTube, and Instagram account is @Marshallmoviemaker. Starting in his first year at Butler, Smith had Professor Farhad Anwarzai for his First-Year Seminar class called "The Coming of Age Story." Smith said that Anwarzai’s willingness to allow students to learn in ways that they enjoyed was a great start to his college experience. Anwarzai said he was blown away with Smith’s work. In Smith's sophomore year, Anwarzai ended up as his professor for the Global and Historical Studies course "China and the Islamic Middle East." This time, he and Smith worked together to write a short film for the students’ final project. The 20-minute film, which was made in nine days with no budget, dealt with the preconceived notions that many have about China and the Middle East. Last summer, Smith had an internship with a company called Train918 that was started by 2016 Butler graduates Tim Valentine and Joshua Gaal. The pair started the company in their senior year at Butler and now create commercials and promotional videos for groups like Downtown Indy Inc. and Indiana University. Smith said that Valentine and Gaal allowed him to take a larger role in the company than a typical intern would, and he was able to take control of certain projects. For example, Smith took photos at a fashion shoot over the summer, just a month into the internship. “It gave me the opportunity to have the camera in my hands, to shoot everything and to come up with concepts, edit it, and call it my own,” Smith said. In between class projects and internships, Smith still works on projects of his own. He has created video compilations of Butler Basketball games. This winter, Smith went on a trip to Northern Ireland where he took more photos of the Irish landscape and worked on one of his projects. Over the past few months, Smith has also been working on what he calls "The Portrait Project," a series of photos and short videos of a subject that are compiled into a short, portrait-style video. This spring Smith will be going abroad once again, this time through the College of Communication's trip to Germany. Through his work, both on his own and at Butler, Smith hopes that he will be able to grow as a filmmaker and one day be able to create on a higher level. Sophomore Thulani Smith follows his passion for filmmaking. One of the hardest challenges in life is saying goodbye, and as graduation day draws near at Butler, we prepare to send the seniors into adulthood. The seniors who will receive their diplomas on May 12 are more than just students. They're mentors and friends who will leave a lasting impact on this campus. Wideman said he hopes to be remembered as a good person, on and off the court. Basketball Manager and Human Movement & Health Science Education major Davis Furman: “I think our 2018 class has a strong impact on the campus for years to come. Since we came onto campus, we have endured a lot of changes in this physical landscape of campus and in the social aspects. Because of these changes, we have had to adapt a lot and I think we have mentored the younger classes so that they could adapt easier as well. I think the changes that have been made on campus and the students in our class will continue to have a strong impact on the university even after we graduate. Emily has also had the opportunity to dance with her younger sister, sophomore Caroline Loughman. Science, Technology, and Society Major Riley Schmidt: “Butler has made me a better student over the last four years because of the challenging, supportive, and dynamic academic environment. The professors have taught me that it is OK to ask for help, a grade does not define you, and how to study more effectively. The small class sizes have allowed me to participate frequently and develop a close relationship with my professors. Because of Butler I have met my lifelong friends and role models who helped me become a person that I am proud of and the best version of myself." After graduation: Chaz hopes to work as an elementary school teacher in the Indianapolis area. Emmy Cook: “My biggest tip for underclassmen would be to take full advantage of what Butler has to offer. If there’s a free event in the Reilly Room, go to it! Go see the ballets and plays. If there’s a seminar on financial management or leadership development, attend that seminar. Get outside of Butler, too. Don’t forget that Butler is such a piece of Indianapolis, and there’s a lot happening outside of Butler—be a part of something bigger than yourself and absolutely dive in. Get involved in service and philanthropic efforts, start interning early. Choose to take a few classes that maybe you don’t necessarily need to take, but simply because they sound interesting and you want to learn. In short, show up and do as much as you can do before you graduate, because you won’t have access to this high a volume of experiences and opportunities probably ever again”. 1. Study smarter, not harder. 2. It’s OK to switch your major. It’s better to figure out what you want to do now rather than later! 3. Get involved, try something new, and then put your time and effort into the organizations you’re most passionate about. 4. STUDY ABROAD! It is the experience of a lifetime packed full of adventure. Graduating seniors share their memories, plans. Andres Pena ’15 sat in his Intro to Marketing class at Butler University last year mulling over a prompt: change the world through a mobile device. Pena considered how the smartphone, with its seemingly endless capability, could be used as a tool to help those in need. He came up with a mobile app that would connect donors to people in developing countries. He approached his friend and fellow College of Business classmate Matt Speer ’15, and the two began to conceptualize an app that would allow users to donate money to nonprofit organizations with the touch of a finger. Two additional business classes in the Entrepreneurship and Innovation program allowed them to further develop and plan what the app might look like. Over a year and a half later, their idea has become a reality. Speer and Pena launched their smart giving app, rippl, on the App store last week. The rippl app enables an iPhone user to donate to select nonprofit organizations directly from their phone, similar to the newfound ease of transferring money on a mobile banking app. With the simple tap of the “Give” button, a user can quickly make a donation to one of the nine featured nonprofit organizations: Wheeler Mission Ministries; US Dream Academy; National FFA Foundation; The Julian Center; Jewish Federation of Greater Indianapolis; The Oaks Academy; The Iris Foundation; Butler University Senior Class; and Big Brothers Big Sisters of Central Indiana. These organizations paid $299 to participate in a two-month trial of the app, which began last week when rippl launched. Speer said the goal of the trial is to prove the value and the worth of the app to investors. The full version of the app is expected for release next fall if the trial is successful. It would include more nonprofit organizations to choose from and additional app features and abilities, he said. Deborah Skinner, Associate Professor of Marketing in the College of Business, helped Speer and Pena while they developed the app in her Leadership and Innovation class, a part of the Entrepreneurship curriculum. She said their passion for the project was infectious, and she felt a strong desire to support them as they navigated building an app from the ground up. But with the launch of this innovative app, the original question still exists: Why hasn’t a mobile giving app been created before? Speer said he discovered the answer to that question on what he calls the worst day of his life. Upon investigating the stipulations of using the App store as a vendor, the duo learned that Apple absorbs 30 percent of a donation if the money is given directly through the app. 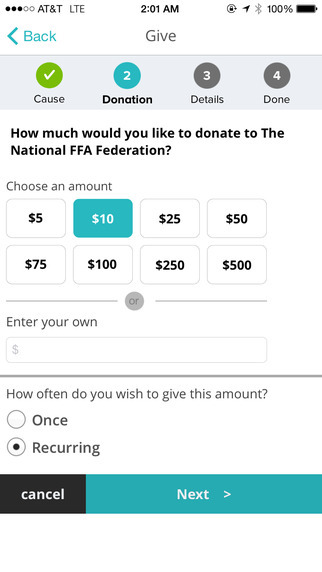 But Speer and Pena solved the challenge: Instead of donating the money through the App store, the donor is directed to an outside web browser that requires them to confirm their selected donation. Once confirmed, the user is brought immediately back into the app. This process has made Speer and Pena pioneers in the realm of charitable giving. “It cuts down the barriers to donate and makes it simple,” Speer added. With success now in sight, Speer thinks back to his spur-of-the-moment 2:30 a.m. email to United Way of Central Indiana CEO Ann Murtlow to pitch the app. Five and a half hours later, he woke to an email from an interested Murtlow. And just like that, rippl became more than just a great idea. For John George ’18, video games were always a casual interest. When he first came to Butler University, he loved playing games like Super Smash Bros. and Mario Kart with friends. In his junior year, George started thinking about starting a club, but he struggled to find other students who were interested in competitive gaming. He also wanted to find a professor to be a club advisor who was as passionate about esports as he is. “I didn’t know anyone who watched competitive video gaming like I did,” George said. Over the summer leading into his senior year, George met the founder of the esports club at Clemson University, who gave him tips and advice about how to get a similar club started at Butler. At the start of the 2017–2018 academic year, George met College of Communication Professor Ryan Rogers, who was new to Butler but had previously done research about video games and was planning to create a class on esports. That class eventually would turn into a team. “Esports has always been interesting to me and something that I could really see taking off [on a college campus],” Rogers said. George and Rogers got started planning early in the year and decided that they wanted individual teams in different games. George went to the Facebook pages of each Butler graduating class and posted information about the new club, looking to find students who might be interested in competing. The first callout meeting was in the fall. After that first meeting, the group got together for a second time in November, where they decided which games they wanted to play, split into teams for each game, and selected team captains who were responsible for finding tournaments for the teams to play in, and scheduling practices. The club started out playing League of Legends, Overwatch, Call of Duty, and Hearthstone. Eventually, after holding tryouts, it added Rocket League and FIFA. The esports group also merged with a more casual group, the Butler Gaming Club. In the fall, the Big East reached out to the Athletic Department and Mike Freeman, Butler’s Senior Associate Athletic Director External Operations, about esports on Butler’s campus. That was the same week that George and Rogers met to discuss forming a team. Freeman said the Big East approached each school to try to find out what was going on regarding esports. The conference found that some schools were active, while others had done little. Freeman knew Rogers had a background in esports, so he reached out about getting involved with the Big East. The conference had partnered with ESL, an esports company that organized tournaments around the world, in hopes of starting competition between Big East schools. Rogers helped to organize the group with the Big East while George held tryouts and streamed the club’s game play. On May 7 and 8, Butler Rocket League and Butler League of Legends competed in Big East play for the first time. Three members of the Butler team competed in Rocket League and five competed in League of Legends. The League of Legends team was swept in Big East play, but the Rocket League team placed fourth. “We went 2-4 [in Rocket League] but we were a lot closer with a lot of the teams and were very close to winning more games,” George said. For the team, the Big East Invitational was a great experience, and in George’s eyes, a great stage for the world of esports. Since the Big East Invitational, Freeman and Rogers have been trying to get the word out about esports on Butler’s campus. Freeman compares the esports club to the way the Butler Athletic Department was when it first started out. As a graduating senior and the founder of the group, George’s time with the club has been short, but he said it's been a fantastic experience. In addition to being fun and an opportunity to meet new people, it allowed him to gain valuable leadership experience. The club also has a treasurer and a social media chair, which George said are great opportunities for students to hold leadership positions in a group they are passionate about. Freeman thinks that the club can have huge benefits to students after graduation as well. To stay up to date with Butler’s esports club, check out their Twitter account and Facebook page. The club hold tryouts for all games each semester. Current and incoming Butler students are invited to reach out to be invited to its Discord channel. Students take the controls on Butler esports team.